Virginia Interactive is helping state government entities introduce mobile-friendly solutions that make web sites, key services and information easy accessible through any Web-enabled mobile device. We are a leader in developing mobile-friendly, award winning government solutions. “Pass the Past,” Virginia Interactive’s very first mobile app designed to help middle school students prepare for Virginia’s Standards of Learning (SOL) exams was developed for the Virginia Department of Education and was awarded second place in the Standards of Learning (SOL) Apple Apps Challenge. The Virginia Grown mobile application won a 2011 Governor’s Technology Award in the Innovative Use of Technology in Economic Development category. 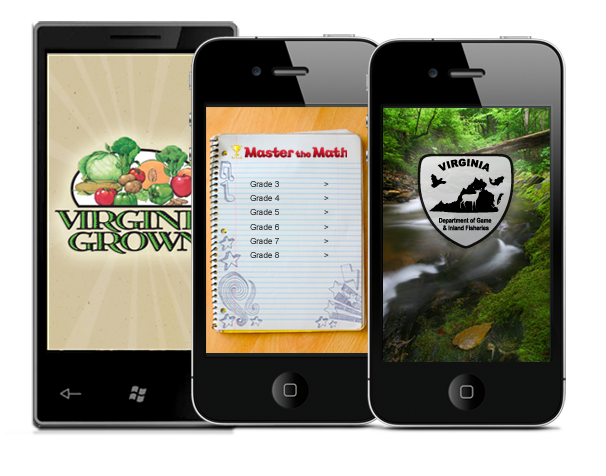 This mobile application, for the Windows 7 Phone, complements and extends Virginia Grown’s efforts to promote fresh Virginia agricultural products. In 2012, the Center for Digital Education recognized Virginia Interactive’s Master the Math Mobile Application as the first place winner in the 2012 Digital Education Achievement Awards (DEAA) and Best of the Web Awards (BOW) Digital Application/Project category. Master the Math focuses on the mathematics curriculum from grades three through eight, and can be used on Apple iPods, iPhones and iPads.